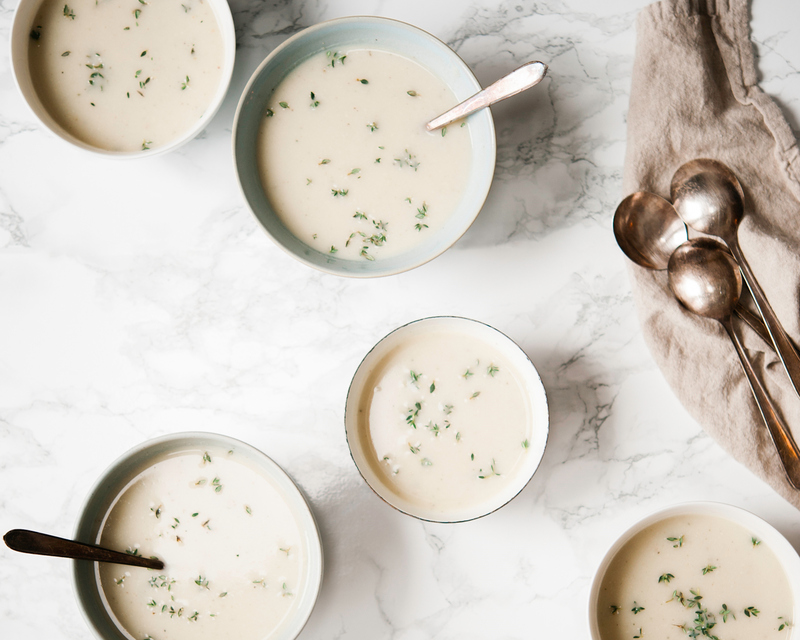 This creamy cauliflower and celeriac soup was our farewell to winter for another year. As it warms up outside, we feel less inclined to eat soups and gradually transition to plenty of cool, hearty spring salads. Anything to avoid turning on the stove when it’s warm out! In lieu of using a traditional mirepoix that consists of onion, celery, and carrots, we added celery’s sibling celeriac to the mix (also known as celery root). While celeriac is not so pleasant on the eyes, once you peel away the twisted, dirty outer layers it reveals a smooth white flesh that packs an earthy, subtle celery flavour. Celeriac is great to eat raw in salads, as a puree that’s a wonderful alternative to mashed potatoes, or in soup recipes as we’ve done here. This soup is great for a chilly evening, or you can turn it into a delicious cold soup by adding in a few pears or apples to the mix. In a pot over medium-low heat, melt the ghee. Add the onions and a pinch of salt, sauteeing until translucent (about 5 minutes). Add in the garlic and thyme, cooking until fragrant. Add in the celeriac and cauliflower, sauteeing for 7-8 minutes until softened. Add in vegetable broth and coconut milk, adjusting if needed. Bring to a boil and reduce to a simmer, cooking until vegetables are completely soft. Puree the soup using either an immersion blender or carefully transfer to a stand blender. Top with a sprinkle of fresh thyme.